Gross Area: 345,000 sq. ft.
Area Per Student: 195.5 sq. ft. When the Pennsylvania College of Health Sciences (PCHS) transitioned from a diploma nursing school to a degree-granting institution back in 2002, enrollment started to rise. As the college was evolving and enrollment increasing, the fragmented five-building campus became impractical for the growing institution. After a nine-year search, PCHS found an ideal site to relocate and consolidate their programming. 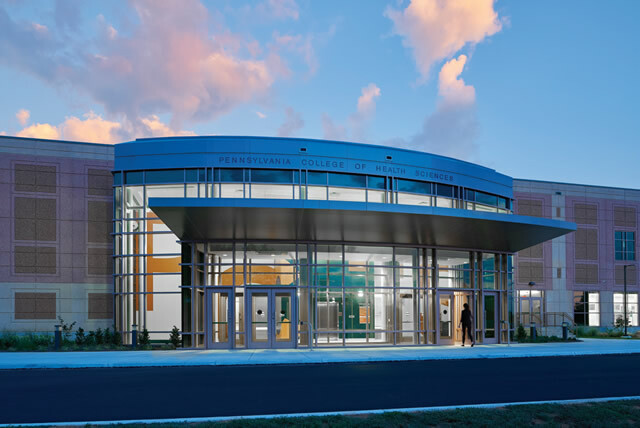 Completed in 2016, PCHS’ new 24.7-acre campus transforms a former office building and manufacturing warehouse in Lancaster, Pennsylvania, into a two-building, 345,000-square-foot state-of-the-art health sciences campus. A glass corridor connects the two buildings; one dedicated to administration and the other to instructional and support space. The Kenneth G. Stoudt building houses administrative offices, an enrollment services department, a collaborative hub for staff, a lecture hall, a dining hall, the office of the president, and a 34-seat cabinet boardroom. 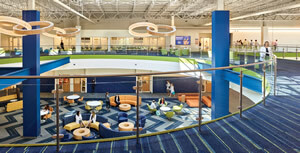 The Emmett M & Anne C. Cooper building contains 27 classrooms, a 400- seat auditorium, wet labs, the Center for Excellence in Practice (simulation center), as well as lounge space, a café, lockers, and a Health and Wellness Center. 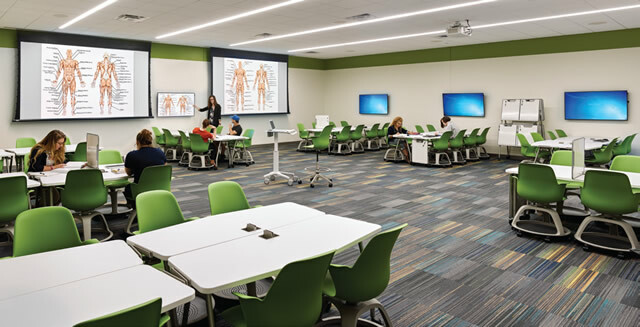 PCHS’ leadership had a clear and powerful vision where “every space [would be] a learning space” for its next generation of medical education students. 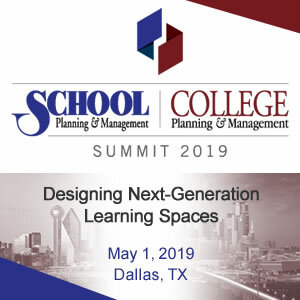 The college’s embrace of innovative approaches to active learning and collaboration gave us a mandate for creating spaces that supported this cultural change. To foster learning outside the classroom, we designed informal collaborative areas that would appeal to a wide array of students, whether they prefer quiet, private spaces or those that stimulate conversation and social engagement. The design of the new campus significantly supports a community of collaboration and transparency both in the classroom and outside. Both buildings are designed and planned to act as a traditional campus. Everyone passes through a central commons to gain access to the classrooms, and faculty office suites that line the perimeter of the building. 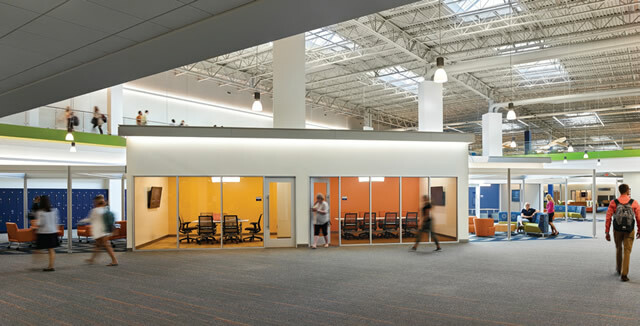 The addition of skylights and windows to the two-story warehouse space, along with a bold color palette, energizes and engages students, faculty, and staff. The informal learning spaces contain flexible/mobile furniture to easily reconfigure areas to meet specific student needs. 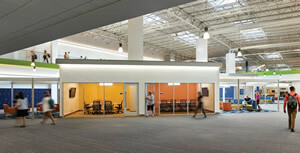 Glass walls surround these spaces to visually connect occupants and put learning on display. Keeping in mind PCHS’ other goal of staff and student health, we designed a Health and Wellness Center as part of the campus. This space includes a fitness center and aerobics room for group exercise as well as a health clinic. With four patient exam rooms, four meditation rooms, and a counselor’s office, students and faculty alike have a destination for both medical and spiritual assistance. The meditation rooms offer students a haven to unplug from the technology that constantly surrounds them. To maximize space for student use, faculty and staff were moved from private offices to open workstations, which had the added benefit of allowing everyone access to natural light and views. To help gain staff buy-in, we invited users to review mock-ups and offered accessory packages to personalize their space and storage needs. After just a short time of being in their new space they noted that it has increased their collaboration with piers. The centerpiece of the new campus is the Center for Excellence in Practice, a 24,000 square-foot hands-on simulation space that replicates a real-life treatment facility. This “mini hospital” features all of the spaces and technology students will find when they enter the practice—40 beds, including six patient rooms, a mock nurse station, a radiology suite, an operating room, a home care suite, and more. It allows students to practice their clinical skills in hands-on simulation environment and learn how to cooperate with one another as they simulate moving patients from pre-op through post-op. Beyond the design and planning involved with an adaptive re-use project, the tight schedule also provided us with another unique set of challenges. 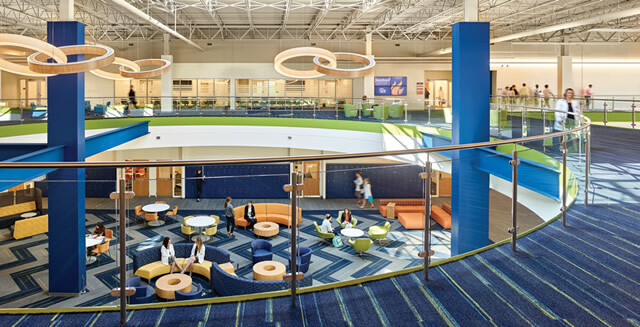 We had 18 months (6 for design and documentation, 12 for construction) to completely retrofit and transform the massive 65,000-square-foot office building and 280,000-square-foot factory/warehouse into a highly developed medical education campus. In order to meet this ambitious schedule, we utilized a Design-Build model that had all parties— from client to contractor—at the table from day one. This helped foster a synergetic spirit and regular communication. We also created a strategic partnership with a furniture manufacturer to help reduce lead times and better adhere to the strict schedule. We held weekly meetings with the entire team, including contractor, project management and the furniture vendor, to discuss progress and monitor the budget. By engaging all disciplines from the beginning of the project, we saved time during the documentation and construction phases due to having already coordinated input from various parties thereby eliminating any surprises. Nice idea in the public spaces where the roof structure is exposed. I like the color palette. A clever adaptive reuse project. Kudos for the sustainable approach.